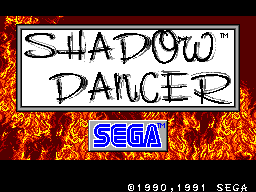 Shadow Dancer - The Secret of Shinobi is a Spin-off of Shinobi as you can see on the Subtitle. This Game was first released in 1990 at the Arcade and this is now the Master System Version. There is also a Version for the Genesis. The Story is simple. 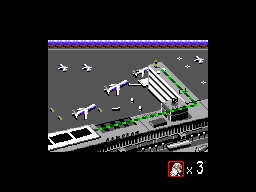 Some Terrorists have hijacked a Space shuttle and you are the One Man (plus dog) Army to stop them. This Game has 4 Levels and 2 different Bonus Games. After every Level you must fight the Boss. In every Level you must kill all the Enemies, some of them leave Bombs when they die, which you must collect. You can fight enemies with all the Weapons a Ninja has, throw Shurikens, fight them with a Katana or use your Special Magic. Also you have a Dog but he is not by your Side like in the Arcade or Genesis Version, you must call him and then he attacks. The Dog is pretty useless you must first 'load' the Dog, by pressing down and then release him. It takes just too much Time. Now to all the bad stuff and there is a lot of it: When you get hit, you die and you have only 3 Lives. I really miss an Energy meter like in Shinobi as the Game would be much easier with it. Also when you die you must play the whole Level again, even if you get killed 1 Meter before the Exit. So take the 'One hit and you're dead' thing, mix it with bad Controls and Enemies who are faster than you and you get a pretty frustrating Game. The Graphic is not that bad. The Characters are quite bad and at least your Ninja has some nice details. The Problem is that everything is too big. Take the first Boss, you fight him on one screen and he is so big that he takes half of it, so it's pretty hard to dodge his shots. As always there are some colours messed up, for example the gunman, he has green skin, but maybe he is the Brother of the Hulk (In the Arcade Version they are black) The Levels are not good designed, most of the backgrounds are boring and for example the campfires in the Airport look really bad. The Animations are good; the Enemies reload their guns and duck while shooting. One weird thing is the dying animation of your Ninja, he pulls out his katana with light speed, then fall to the ground and dies, but at least it is nice animated. The Music is the typical Ninja Sound and it gets boring really quick. The Sound effects are bad, from throwing Shurikens to the Gunshot sound, everything has bad effects and sounds bad There is also some Speech when you use the Ninja Magic but I never figured out what he say or what Language it is. The Game takes use of everything the Game pad has to give. Button one throws Shurikens and Button 2 is to jump. 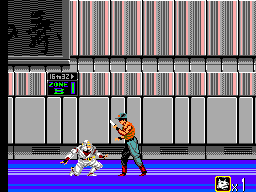 Press up and jump and you reach the higher Level just like in Shinobi. Also like Shinobi press Up and Button 1 for Magic and Down for the Dog. There is nothing bad about the Controls, except that Takashi can't jump. He jumps way to low so even the tiny fires can be a Problem. This must be of the most frustrating Games ever. I don't know how many times I died and even the first Boss is unbelievable hard to beat. I know some people who beat the Game and if you know how the Enemies react and how you must fight the Bosses, you can finish this Game in about 12 Minutes. So it is a rather short Game. I don't there think there is a reason to play this Game again. If you like ninja Games go and buy Shinobi or Ninja Gaiden, both Games are way better.